The double-pivot design of the spring-reset standard uses tension spring force to return the standard to the working position. Land wheels help to stabilize the plow in both the working and transport positions. They also control the depth of plowing and work in conjunction with raising and lowering the plow. Land wheels on rigid plows are tied to the Adjust-O-Cut bar for automatic setting for each width of cut. A single wheel is standard on the six-bottom model; dual wheels are standard on the seven- and eight-bottom models and optional on the six-bottom model (recommended in softer soils). Provides good trailing characteristics in transport. The operator can change the plow's width of cut to match the tractor horsepower and soil conditions. The rigid plow has a width-of-cut range of 356 mm to 559 mm (14 in. to 22 in.) on land and 508 mm to 559 mm (20 in. to 22 in.) in furrow. The flex plow has 356 mm to 559 mm (14 in. to 22 in.) of cut. Adjustments are made by adjusting two turnbuckles (arrows) to a predetermined length specified in the operator's manual. 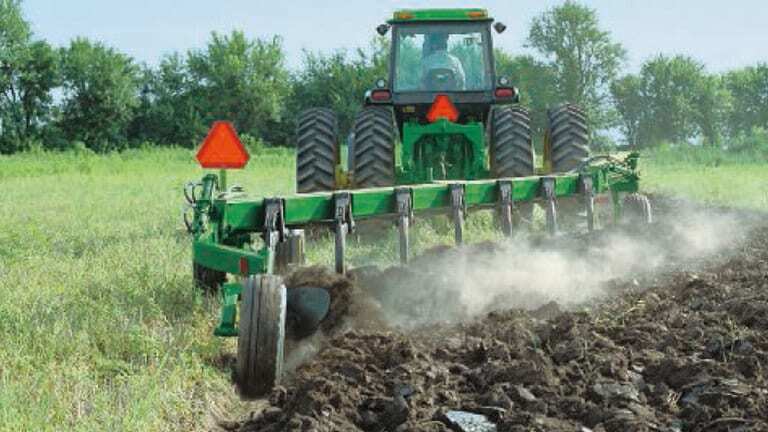 Both rigid and flex plows are designed to handle tall and heavy residue levels. Design uses minimum space, gives a clean-style appearance, and has a full range of adjustment. Economical turnbuckle is used to make the adjustment. Operator-supplied 76-mm x 203-mm (3-in. x 8-in.) American Society of Agricultural Engineers (ASAE) tie-bolt hydraulic cylinder may be used in place of a turnbuckle for in-furrow applications. Depth stops are used for easy adjustment of the depth. The NU bottoms are set behind the mainframe to prevent the mainframe from becoming a pinch-point for residue. They are designed for light draft and high-speed plowing. Available in 400-mm (16-in.) and 450-mm (18-in.) sizes with an unpolished finish. * In some soil conditions at plowing depths in the 254-mm to 356-mm (10-in. to 14-in.) range, soil may boil over the moldboard, resulting in poorly defined furrows. Both the NU 400 and the NU 450 come standard with heavy-duty, full-cut shares. The gumbo moldboard (A32211) is available for NU 400 bottom and is recommended for use in heavy soil (gumbo) conditions. It is similar to the NU 400 bottom except that it has less area at the wing tip. Moldboard will not be forced upward by soil movement as much as NU 400. Permits soil to push off easier for better scouring and lighter draft. 13-mm (1/2-in.) wear, 89 mm (3.5 in.) remaining. Plastic or steel trashboards can be added to NU bottoms to improve coverage in tall, heavy residue. Plastic trashboards are only recommended for non-abrasive soils where scouring is a problem with steel trashboards.